UPDATE: The meeting start time has been moved back to 6:00 p.m.
School Board members and Providence Public School officers will present information and answer questions about next year’s budget. If you missed last week’s presentation at Central High School, this is a good opportunity to become informed about the budget situation. Note: you can read more about the budget here. Jill Davidson, Dr. M.L. King Jr. Elementary School PTO President and ESPEC Steering Committee member, has sent word that King’s principal, Michael Lazzareschi, has been named Rhode Island Elementary Principal of the Year by the Rhode Island Association of School Principals. 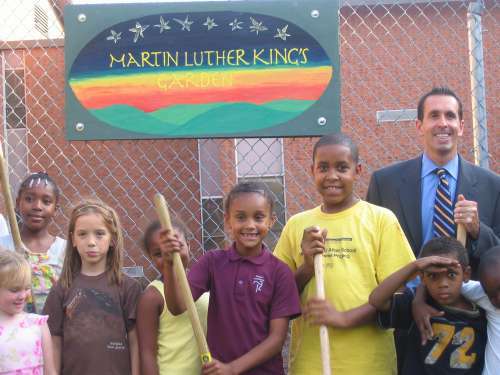 The photo of Mr. Lazzareschi at right is from a ProJo article about the groundbreaking at King’s new garden. Last night I attended the Providence School Board’s budget presentation, about which subscribers to the ESPEC email list were informed in an email. Mark Dunham, the PPSD chief financial officer gave a formal presentation of the budget figures. This was followed by a Q&A session, with questions coming first from School Board members, and then from the public. I had to leave before the public Q&A to attend another meeting. Linda Borg has a story on the meeting in today’s Providence Journal. You can see Mr. Dunham’s presentation here. (PDF version of a Powerpoint presentation). Of the $382.6M, $323M comes from “local sources” (city and state funds). Of the $323M, $199M comes from the state and the remainder from the city. The state’s share of the budget has been shrinking over recent years, from 63.5% in 2003 to 59% in 2009. Projective revenues (given no state increase over last year) are $313.2M. Thus, the District faces a $9.7M shortfall. PPSD has cut $25M (300 positions) in the last 5 years. Independent studies show that Providence is an efficient district. 98% of the budget is fixed costs, only 2% is discretionary. The only solution, absent a funding increase, is to continue to cut programs and services. Nonetheless, Providence’s per-pupil spending of $13,782 is right about at the state average ($13,660). Providence teacher salaries are 2.8% higher than the state average. The School Board will vote on the budget on April 28th, and the Mayor will submit his budget to the City Council on May 1. The Council will hold budget hearings in May and June, with a July 1 deadline for passage of the budget. The situation described above is clearly dire. What can be done? Obviously, advocating for adequate funding in the City Council is a logical next step, though it’s unclear that the City can raise the funds. Several groups, including ESPEC, have advocated before the state legislature for more state funding. Despite those efforts, the General Assembly last year killed a 3% increase proposed by the Governor. Regrettably, members of the Providence delegation, including East Side representatives voted against the increase, despite the dramatic negative effects on Providence. Given the current state budget crunch, things don’t look better in the G.A. for this year. One possible ray of hope lies in a bill, THE EDUCATION EQUITY AND PROPERTY TAX RELIEF ACT (S-2650) introduced by Senators Gallo and Perry. The bill would create a funding formula based on student need and community wealth. Given Providence’s high number of students in poverty, this would be highly beneficial to our City, but it would also improve the situation for a large number of other communities. More on this later. After taking over a community meeting for East Side elected officials last October, the subject of teacher “bumping” has generated much discussion at different levels. Cliff Wood, one of the forum participants, convened a meeting of the Providence City Council’s Education Committee to gather information on the subject. Recently, the East Side Public Education Coalition (ESPEC) accepted an invitation from Rhode Island House Majority Leader Gordon Fox to provide a draft of proposed legislation for him to review and submit to the General Assembly. ESPEC’s draft bill, which was filed as Bill S-2620 by Senator Rhoda Perry, can be viewed online at http://www.rilin.state.ri.us/billtext08/senatetext08/s2620.pdf. Because ESPEC lacks professional expertise in this policy area, its proposal adopted language that appears in the current Massachusetts law. Massachusetts public schools have improved greatly since the enactment of the 1993 education reform law, which was enacted after a court ruled that the state’s education program failed to meet Constitutional requirements. While Massachusetts and Rhode Island offered comparable programs in 1993, over the last 15 years, the Bay State has improved at a much faster rate than the Ocean State. While Massachusetts has not solved the bumping problem entirely, the 1993 reforms included several initiatives that reduce the problem significantly. The 1993 law instituted a systematic program of teacher evaluation, consisting of a set of baseline standards developed by the state, with the opportunity for local districts to supplement. The 1993 law instituted certain “site based management” reforms, under which principals are authorized to evaluate teachers and to remove them for failing to meet performance standards. Finally, the 1993 law removed the requirement of seniority-based terminations for layoffs. These three initiatives provide the basic structure of the ESPEC proposal. Were the ESPEC proposal to become law in Rhode Island, teacher performance could become a new standard for comparing teachers when making personnel decisions. Teachers at Hope High School have accepted the concept of “peer based” evaluation, but Providence lacks any district-wide policies or standards to evaluate teachers. The same is true for the majority of other districts in the State. ESPEC has not researched how performance evaluations have fared in Massachusetts, although the Commonwealth’s overall increases in student achievement suggest a beneficial result. Note: It’s been a busy week and I’ve not posted much. Ironically, the things I should be posting about are the things that have kept me from posting. Today is catch-up, beginning with a Wednesday 4/2 ProJo article about “anti-bumping” legislation that got a hearing that afternoon. I’ll follow up with some notes on the hearing itself. PROVIDENCE — Legislation that would make it impossible for school districts to lay off teachers purely on the basis of seniority was expected to be heard before the Senate Committee on Education this afternoon. The proposal was written by members of the East Side Public Education Coalition, a parents’ group, and is being sponsored by Sen. Rhoda E. Perry, D-Providence. Sam Zurier, a lawyer and member of the East Side coalition, said his group decided to take on the issue of bumping after it became a topic of concern at a summer education forum at the Martin Luther King Jr. Elementary School. At a meeting with Supt. Donnie Evans in early February, teachers sounded off about bumping, the process by which teachers with more seniority displace those with less. In one case, three teachers were hired on the same date. In a process called a tie-breaker, each teacher was assigned a number and the number that was plucked from the mix won the job. Other teachers described their frustration at not knowing whether they will return to the same school or the same classroom from one year to the next. Because of the budget crisis this year, even senior teachers are losing their classrooms. In some smaller schools, it isn’t unusual for the principal to lose a third of the staff, which makes it difficult to build a shared culture.